Can a Catholic Pope be a Non-Catholic? There are several Feeneyite groups such as the Dimond Brothers of the Most Holy Family Monastery, and Elias Talani of catholic-saints.net. These groups have argued against the doctrine of Baptism of Desire and Blood as a heretical doctrine. They all use very clever arguments that seem to affirm their position. 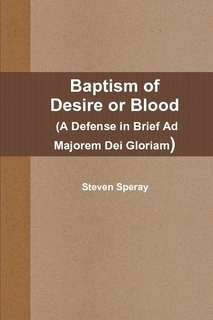 In my book, “Baptism of Desire or Blood (A Defense in Brief Ad Majorem Dei Gloriam)” you will find sound arguments defending the Catholic doctrine of BOD/BOB. However, there is one particular never-before-seen argument that I use that definitively proves that BOD/BOB is true or else rejecting this doctrine will amount to blasphemy against Christ. It is the single most important argument in proving BOD/BOB and the end to all arguments against it. You will only find this argument in my book on pages 67-68. The exchange involved the de fide teaching that unbaptized infants go to eternal hell. With this dogma, I demonstrated how John Paul II and Benedict XVI could not be considered Catholics for rejecting this teaching. The Councils of Florence and Lyons II both taught as a matter of faith that those who die in actual mortal sin or original sin only immediately go to hell but suffer different kinds of punishments. Earlier, the Church at the Council of Carthage under Pope St. Zosimus solemnly stated: “If anyone says that, because the Lord said ‘In My Father’s house are many mansions,’ it might be understood that in the Kingdom of Heaven there will be some middle place, or some place anywhere, where the blessed infants live who departed from this life without Baptism, without which they cannot enter into the Kingdom of Heaven which is life eternal: Let him be anathema. With these three statements, we have repeated Catholic teaching that unbaptized infants do not go to heaven. This is a Catholic dogma! John Paul II and Benedict XVI both said that Catholics may hope for the salvation of unbaptized infants. This means that they either reject the de fide teachings outright or they are calling them into question by implication. However one looks at it, they are saying that you may hope against a dogma. One cannot hope against this dogma anymore than you can hope the Calvinists are right about justification or the pope is not infallible. Over the years, saints and popes have disagreed whether unbaptized infants actually suffer any fire or some other terrible torment. Limbo was a word used to describe the possible place in eternal hell for these children. Limbo or on the border of the fires of hell was positively accepted as an answer by Pope Pius VI against the Jansenists who misunderstood Carthage and said they absolutely suffer fire. One side could not condemn another side for either viewpoint. Now, Cortes wrote to me boastfully rejecting all these Councils on the point that unbaptized infants go to hell because he thinks they all contradict one another as he attempts to demonstrate in his article. Cortes begins his article with the run of the mill line that sedevacantists reject Christ’s promise that the gates of hell shall not prevail. I answer this elsewhere on my webpage. After the preliminary paragraphs, Cortes immediately cuts to the chase. He admits that rejecting a dogma would amount to heresy. Therefore, he attempts to show that these teachings are not dogmatic. However, he misrepresents the argument because limbo is not the issue at all. I made this clear to him in our email exchange. If all Benedict XVI did was to say that limbo was a “theological hypothesis” you would not hear any argument from sedevacantists. But John Paul II and Benedict XVI went much farther by saying that we can hope that those unbaptized infants go to heaven which means they hope the heretic Pelagius was right and the entire history of the Church especially those 3 councils were wrong. The entire argument of Cortes hinges on trying to prove that Carthage, Florence, Lyons II are not de fide on this point. How does he try to do that? He thinks by showing that contradictions in the Councils and papal teachings, then by that fact alone the doctrine that those who die in original sin only would not be a de fide teaching. That being said, let’s look at the argument Cortes proposes. “The souls of those who die in mortal sin or with original sin only, however, immediately descend to hell, to be punished however with disparate [different] punishments. Cortes continues that the African Fathers understood Carthage to mean that un-baptized infants share in the common positive misery of the damned and therefore contradicts Florence and Lyons that speak of sufferings of different kinds. The problem with this argument is simple. The African Fathers simply understood Carthage correctly that unbaptized infants don’t go to heaven. Some codices containing a ninth canon (Denzinger, loc. cit., note 3): Children dying without baptism do not go to a “middle place” (medius locus), since the non reception of baptism excludes both from the “kingdom of heaven” and from “eternal life”. Cortes went with this statement and based his argument on it. The Encyclopedia is simply in error on this point since Florence and Lyons defined that unbaptized infants go to hell, which confirms Carthage that they don’t go to heaven. Perhaps, this was one of the reasons Pope St. Pius X, when presented with the Catholic Encyclopedia, through it to the ground and called it modernist. There are no and were never any contradictions between the councils and popes as Cortes says about this doctrine. Cortes must think God is indeed a perjurer since he denies the de fide teachings of Carthage, Florence, and Lyons while saying they contradict one another. Lastly, Cortes has one more trick up his sleeve. With every illusion, there is something you don’t see. What Efrain hides from you is the context of Pope Pius IX. As you can see, Pope Pius was referring to those other than unbaptized infants since infants cannot observe the natural law and its precepts and ready to obey God while living honest lives. All infants can do is eat, sleep, dream, cry, etc. Therefore, Pope Pius IX was not contradicting anything. All he was doing was illustrating the doctrine of Baptism of Desire which only those of reason can have. The Councils of Florence and Trent, and the Trent’s catechism all state that infants cannot have eternal life without the sacrament of Baptism. But for the sake of the argument, let’s say that Pope Pius IX was referring to those infants. Did he say they go to heaven? No, he didn’t but rather said “to suffer eternal punishments.” This still does not contradict the three councils. The limbo in hell is explained by St. Thomas Aquinas as not suffering eternal punishments in the sense that they don’t suffer torments. No matter how you interpret it, Pope Pius IX remains in line with historic Catholic teachings. The rest of Cortes’s article was referring to the controversies over the centuries of what kind of punishments these children have while thinking it has to do with what he thinks are contradictions between the councils. The Catholic Church has never defined it. Pope Pius VI did condemn one side for saying that it is the fires of hell or some other torment is de fide. What is clear though and according to every saint, pope and theologian, is that it is a de fide or dogmatic teaching the unbaptized infants don’t go to heaven. What they suffer is not the issue. John Paul II and Benedict reject the dogma. During our email exchange, I asked Efrain Cortes, give me de fide from another Council and tell me how it is de fide but Carthage, Florence, and Lyons are not. Again, he boastfully said that he rejects Carthage, Florence, and Lyons because they are not de fide. How do we know for sure Cortes is wrong and they are in fact dogmatic on this point? Vatican I made it perfectly clear. Did the popes at the councils intend this to be held universally? Yes. Did the popes at the councils use either universal ordinary or extraordinary teaching power? Yes. Those three councils were teaching an object of faith that unbaptized infants don’t go to heaven. This is confirmed in the great work of Dr. Ludwig Ott’s Fundamentals of Catholic Dogma with the highest form of approval with both the Nihil Obstat by Censor Deputatus and the Imprimatur by the Ep. Corgagiensis et Ap. Adm. Rossensis on the 7 October, 1954. Even if they were not infallible (although they are) can you reject them as a Catholic? Efrain says, of course you can, and he does. The very pope that he uses to defend his modernist religion is the very pope who condemns him here. The position I’ve given is harmonious. All the teachings work together without any contradictions. Cortes’s position does not work at all and he has to contradict Pope Pius IX in the process. The reason he rejects the three councils on hell is simple. To be united to Modernist Masonic Rome, you have to reject historic Catholic teachings. I told him that in my email. I also told him that you won’t find me rejecting a single universal teaching from the historic Catholic Faith. The Vatican 2 religion was founded in the 1960’s with new doctrines and worship services. I have given over 10 dogmas and practices clearly rejected by the Vatican 2 religion elsewhere on my website. He quoted a Bible passage to help his position. Notice that this passage does not support his position. Jesus is implying that children can be hindered by not letting them come to Him. If infants are not baptized they are hindered and neglectful parents can do so. Christ says don’t. He didn’t say that they couldn’t. This poor attempt of Efrain Cortes to defend the heretic/apostates of John Paul II and Benedict XVI only proves sedevacantism while making Cortes a formal heretic by his own words. I warned him over and over. He wanted to go to press to prove himself right, but in the end, only proved sedevacantism was correct. I was trying to use discretion while trying to convert him by way of sound logic and reasoning. Some people are just too prideful to admit when they are wrong. EFRAIN ATTEMPTED TO REFUTE MY ARTICLE BELOW, BUT AS YOU WILL SEE, IT IS FUTILE. I GIVE THE REPLY TO EVERYTHING HE WROTE TO ME IN THE COMMENT SECTION AS WELL THAT HE Submitted on 2009/10/22 at 12:54am. SINCE MANY PEOPLE MAY MISS THE COMMENT SECTION, I THOUGHT I WOULD JUST PLACE THIS ONE AFTER THE ORIGINAL ARTICLE. SINCE EFRAIN PUT THIS IN PUBLIC IN MY COMMENT SECTION, I WILL RESPOND IN BOTH PLACES SO THAT YOU CAN SEE HIS ILLOGICAL AND FALSE ARGUMENTS. EFRAIN, Steven, Steven , Steven. You sure have become childish – and confused beyond that. REPLY: SORRY, BUT YOU ARE THE ONE CONFUSED AND CHILDISH SINCE YOU NEVER ANSWERED THE QUESTIONS I ASKED YOU. I WARNED YOU, AND NOW YOU HAVE BEEN EXPOSED IN PUBLIC! The fact is, this highly credible source, for hundreds of thousands of Catholics, specifically states that Carthage is NOT binding on the Universal Church. REPLY: YOU SPEAK AS IF THE ENCYCLOPEDIA IS DE FIDE AND YET YOU COULD NEVER GIVE THAT DE FIDE TEACHING FROM A COUNCIL AND TELL ME HOW IT IS DE FIDE AS OPPOSED TO CARTHAGE, FLORENCE, AND LYONS. THE ENCYCLOPEDIA IS NOT INFALLIBLE NOR IS IT EVEN A CHURCH DOCUMENT. IT IS IN ERROR SINCE FLORENCE AND LYONS DEFINED THAT INFANTS GO TO HELL. YOU NEVER ADDRESS THOSE COUNCILS OR THE OTHER EVEN HIGHER AND CREDIBLE SOURCE OF DR OTT’S FUNDAMENTALS OF CATHOLIC DOGMA THAT PLAINLY STATES THAT FLORENCE AND LYONS IS DE FIDE ON THIS POINT. EFRAIN: The argument you present throughout your article is weak precisely for this reason. Because your article is filled with your own claims and interpretations and no credible sources, whatsoever, to substatiate any of them. REPLY: BOY, ARE YOU FUNNY. YOUR WHOLE ARTICLE IS FILLED WITH YOUR OWN CLAIMS AND INTERPRETATIONS AND YOU DON’T THINK THAT OTT IS A CREDIBLE SOURCE? THE FACT IS YOU ALONG WITH YOUR ANTIPOPES HAVE TO OUTRIGHT REJECT 3 COUNCILS. EFRAIN: True you cite Vatican I. But then you butcher it with your own interpretation. REPLY: WHAT INTERPRETATION? I JUST GAVE YOU WHAT IT STATES AND YOU REJECT IT. EFRAIN: True you cite Carthage. But then you butcher it with your own interpretation. REPLY: BUTCHER IT? YOU’RE THE ONLY ONE WHO HAS BUTCHERED IT. EVEN THE CATHOLIC ENCYCLOPEDIA AGREES THAT CARTHAGE WAS REFERRING TO HEAVEN NOT HELL. EFRAIN: true you cite Pius IX. But then you REALLY butcher it with your own interpretation. “Here, too, our beloved sons and venerable brothers, it is again necessary to mention and censure a very grave error entrapping some Catholics who believe that it is possible to arrive at eternal salvation although living in error and alienated from the true faith and Catholic unity. Such belief is certainly opposed to Catholic teaching. EFRAIN CONTINUES: In fact, since Pius specifically refers to these people as Catholics, we must believe these people are actually baptized. For this is how an irreligious person is initiated into the Catholic faith – through baptism. Thereby, earning the name Catholic. REPLY: WRONG, WRONG, WRONG. PIUS IS REFERRING TO CATHOLICS WHO BELIEVE THAT THOSE WHO ARE NOT CATHOLICS CAN ATTAIN SALVATION SINCE THOSE ARE THE ONES HE SAYS ARE…ALIENATED FROM THE TRUE FAITH. YOU SIMPLY DON’T KNOW WHAT YOU ARE TALKING ABOUT. NOT TO MENTION, YOU ARE THE ONE BUTCHERING UP PIUS HERE WITH YOUR OWN RIDICULOUS INTERPRETATIONS. This is simply wishful thinking on Steven’s part. REPLY: NOT AT ALL, SINCE BAPTISM OF DESIRE IS THAT TEACHING OF THOSE TRYING AND THIS IS THE SOURCE CATHOLICS GO TO EXPLAIN THE DOCTRINE. YOU’RE SIMPLY MISSING THE POINT. EFRAIN CONTINUES: What Pius is clearly doing is, distinguishing between those who sin deliberately and those who do not. Hence, my question is still valid. REPLY: WRONG AGAIN. YOUR QUESTION IS NOT INVOLVED IN THE CONTEXT. I’VE ALREADY POINTED THIS OUT IN MY ARTICLE. GO BACK AND READ IT. THOSE WHO SIN DELIBERATELY AND THOSE WHO DON’T ARE THOSE WHO TRYING TO LIVE HONEST LIVES OBSERVING THE NATURAL LAW. Where in this section does Pius refer to “baptism of desire?” In fact where in the entire document does he do so? REPLY: YOU MISS THE POINT. BAPTISM OF DESIRE IS WHAT HE IS DESCRIBING WHICH IS FOR THOSE WHO HAVE ATTAINED REASON. WHERE DOES PIUS IX EVEN COME CLOSE IN REFERRING TO INFANTS? EFRAIN CONTINUES: The fact is, Pius does contradict Lyon II and Florence. REPLY: NOT AT ALL. FLORENCE AND LYONS WAS NOT ADDRESSING THE EXCEPTIONS TO THE RULE SUCH AS DESIRE. I QUOTE OVER 20 POPES IN MY BOOK ON BAPTISM OF DESIRE THAT SAY THE SAME THING AS FLORENCE AND LYONS AND THEY ALSO SPEAK ABOUT EXCEPTIONS. EVEN FLORENCE ITSELF DOES THAT. I QUOTED THAT PART IN THE ARTICLE. THIS IMPLIES THAT ADULTS CAN HAVE ANOTHER REMEDY AVAILABLE TO THEM IN ORIGINAL SIN THAT CAN’T RECEIVE BAPTISM. IT IS DESIRE. THIS IS THE EXCEPTION FOUND RIGHT IN THE COUNCIL ITSELF. INFANTS DON’T QUALIFY FOR THE EXCEPTION. THE CATECHISM OF TRENT SAYS THE SAME THING AS FLORENCE AND LYONS BUT THEN GIVES THE EXCEPTION TO THE RULE BY MENTIONING THOSE WHO DESIRE. THIS IS SO SIMPLE EFRAIN, AND YET YOU CAN’T GET IT! REPLY: IT IS INFALLIBLE! YOU COULDN’T EVEN GIVE AN INFALLIBLE PRONOUNCEMENT FROM ANOTHER COUNCIL AND TELL ME WHAT MAKES IT INFALLIBLE. YOU, EFRAIN ARE DESPERATE IN DEFENDING YOUR DEVIL POPES. Either Lyon II and Florence are not DE FIDE or Pius IX is a heretic as Steven claims Pope John Paul II and Benedict are for contradicting these two councils. REPLY: I’VE ALREADY GIVEN THE REPLY ABOVE ABOUT EXCEPTIONS. ANTIPOPES JPII AND BENEDICT ARE THE ONES CLEARLY CONTRADICTING THE COUNCILS, NOT POPE PIUS IX. AGAIN, I EVEN GIVE AN ANSWER IN THE ARTICLE FOR THE SAKE OF THE ARGUMENT. IT’S CLEAR AND PRECISE! EFRAIN: Lastly, Steven never makes mention of the fact that he contradicts his fellow Sedevacantists whom I cite. REPLY: I DID TOO! POPE PIUS VI CONDEMNS THEIR VIEW WHICH IS THAT IT IS DE FIDE THAT INFANTS SUFFER FIRE. YOU MAY HOLD THAT INFANTS SUFFER FIRE BUT YOU CAN’T SAY IT IS DE FIDE. THOSE SEDEVACANTISTS ARE DEAD WRONG! REPLY: THE ONLY CONTRADICTIONS ARE ABOUT SUFFERING WHICH HAS NEVER BEEN DEFINED. I ANSWER THIS IN THE ARTICLE. PERHAPS YOU SHOULD READ THE ARTICLE BEFORE MAKINGS SILLY COMMENTS LIKE THIS. EFRAIN: While they still believe Carthage, Lyon, and Florence are dogmatic, they admit that everyone from Popes on down contradict each other on the very point I make in my article. For a dogma (a truth revealed by God) cannot entangle itself in contradiction. REPLY: I’VE PROVEN THAT THERE ARE NO CONTRADICTIONS. THEY ONLY EXIST IN YOUR MIND EFRAIN. Which Sedevacantist sect is right? Nice try Steven – POOR, POOR CONFUSED STEVEN. REPLY: THE CATHOLIC SEDEVACANTISTS LIKE ME ARE RIGHT! I’VE PROVEN IT. EFRAIN AUTOMATICALLY LOSES ALL PAST, PRESENT AND FUTURE ARGUMENTS AND DEBATES ABOUT WHAT IS AND IS NOT CATHOLIC SINCE HE CAN’T TELL WHAT IS AN INFALLIBLE DOCTRINE AND WHY AS HE ALSO REJECTS NON-DOGMATIC TEACHINGS WHICH POPE PIUS IX CONDEMNS. IT’S OVER FOR EFRAIN AND HIS DEVIL POPES! “FR” BRIAN HARRISON BROUGHT UP TO A FRIEND THAT FLORENCE AND LYONS SAID, “THOSE IN ORIGINAL SIN ONLY” AND NOT “UNBAPTIZED INFANTS” THEREFORE ROME HAS NOT NECESSARILY GONE AGAINST THE TWO COUNCILS. Who are those who die in original sin only? Catechumans sincerely wanting baptism go to heaven by desire. Catechumans not sincere would not be in original sin only since it would be a mortal sin not to sincerely wanting to do Christ’s will. Pius IX speaks of those who are trying to live honest lives obeying the natural law, and they go to heaven by implicit desire. Those not living honest lives would be in mortal sin. Infants and mentally challenged which I’ll put together. Both of these can go to heaven by Baptism of Blood. Sure, there might be other exceptions but they would still be exceptions. Infants and mentally challenged with no exceptions such a Baptism of Blood. Therefore, the only ones Florence and Lyons could be speaking about would be this last group. Again, Florence speaks of no other remedy for infants but the sacrament (presuming no other exception like BOB). Unless Rome is excluding the mental cases, Rome says we can hope they both go to heaven, which would mean that…we may hope that all those who die in original sin only go to heaven? What good is the dogma if there is nobody who goes to hell in original sin only? Either Rome is saying that you may hope against a dogma, or that a dogma is meaningless. -In 1986 and 2002, John Paul II invited all the world’s religious leaders to come to Assisi, Italy and pray and offer sacrifices to each of their individual gods for world peace. Leaders from Eastern Orthodoxy, Protestantism, Judaism, Islam, Buddhism, Hinduism, Tenrikyo, Shintoism, Sikhism, Zoroastrianism, and Voodoo attended with prayers and even with animal sacrifices from the Voodooists all in the name of peace. These Events were praised by Mother Theresa and were defended and justified by theologians around the world using the writings of great saints such as St. Thomas Aquinas. Such is the New World Religion of the New World Order. Butchering the very meaning of the great saints to justify evil. In 2006, Benedict XVI celebrated the 20th anniversary of the first Assisi Events. Throughout Catholic history, we see the Church condemn false beliefs and proselytize pagans, Protestants, and all infidels. In looking at these Events in the modern world, we see a clear-cut contradiction to the teachings of the Catholic Church and Her practice. To demonstrate this, we could look at Mortalium Animos by Pope Pius XI as a recent example, or go back to the Apocalypse of Holy Writ on Babylon’s Harlotry. However, the following anecdotes will best illustrate the contradiction between the Assisi Events and historic Christianity. -St. Peter and St. Paul inviting pagan Romans to come to the catacombs and pray to Jupiter, Saturn, and Mercury for world peace rather than seeing them as antichrists. -St John inviting over Cerinthus to pray instead of refusing even to use the same bathhouse as John did. -St. Thomas inviting Hindus to pray to Vishnu for guidance and peace rather than telling them that only Christ can save them. -St. Athanasius inviting Arians to pray to their anti-Trinitarian god for peace and reconciliation rather than slap them in their face as St. Nicholas did at Nicea. -St. Ambrose and St. Augustine inviting Pelagians and Manicheans to come and pray with them rather than calling them agents of the devil. -St. Patrick inviting the Druids of Ireland to offer sacrifices to their gods rather than proselytizing them to become faithful followers of Holy Trinity. -St. Leo the Great inviting Attila and the rest of the Huns to come inside St. Peter’s so they can pray to all their gods so that there will be peace rather than telling them to leave Rome. -St. Francis of Assisi praying with the Muslims rather than telling them to believe in Jesus and convert to Catholicism. -St. Anthony of Padua inviting Cathars to come in the local Catholic Church and pray for unity and peace, not tell them they are on the road to perdition unless they repent and be reunited to the faith. -St. Francis Xavier inviting the local Buddhists to chant and pray their beads while he prayed his Rosary by demonstrating that it’s okay to be Buddhists. -Hernando Cortez and Bishop Zumarraga recognizing as a religion deserving of respect and honor Aztec Paganism and inviting the Aztecs to pray to Quetzelcoatl and Huitzilopochtli rather than seeing it as devil worship. -Pope St. Pius V inviting all the new Protestants to come to Rome and pray with Catholics rather than condemning them for holding to heretical beliefs and practices. -Pope St. Pius X inviting all the Modernists to come and pray that we all get along rather than anathematizing and saying that modernism is the synthesis of all heresies. Yea, right! That’s what the Assisi Events are like but anybody of goodwill can see they are so far off the mark of true Christianity that it is not funny. Many Catholics think the Events were scandalous, but the fact is the Assisi Events within themselves are more than scandalous. They are acts of apostasy. John Paul II arranged for all crucifixes to be removed or covered. He gave each false religion their own special room they asked for such as an unblessed room for the Jews where Christ had no part of, or one with windows for the Zoroastrians as the smoke of their god Adar could escape. John Paul provided all the pagans and infidels the special rooms to aid in their worship. It is a total and disgusting lie that there were underlying theological principles keeping the Events from being heretical. In fact, they were Masonic and are not backed by any Catholic theology whatsoever. Again, some even go so far as to use statements of St. Thomas Aquinas to justify these abominable events. The Assisi Events are unspeakable crimes because they tell us that Masonic Rome wants us to be partakers with devils. Note again, that even Voodoo priests were invited by Rome to sacrifice animals to their demons and it happened not once but twice. Anyone who acted, promoted or defends these diabolical acts is in no way Catholic but rather apostates. The Assisi Events are proofs that John Paul II and Benedict XVI who recently celebrated the 20th anniversary of the events are both non-Catholic apostates much less heretics which makes them both antipopes. They both reject the Gospel of Jesus Christ and accept the gospel of Masonry (antichrist). IF YOU’RE IN UNION WITH BENEDICT XVI BY GOING TO A MASS UNITED TO MODERNIST NON-CATHOLIC ROME, THEN YOU ARE IN UNION WITH THE VERY AGENTS OF HELL.